A large majority of the population support the idea of presumed consent for organ donation, survey findings have suggested. Two-thirds of more than 2,000 people surveyed by the British Medical Association said the UK should move to an opt-out system. Every year hundreds of people die because of a shortage of donor organs. Just over a quarter of the more than 2,000 people surveyed in England, Scotland and Wales, said they were on the NHS Organ Donor Register. Yet nearly two-thirds said they would be willing to donate their organs for transplantation after their death. Under the presumed consent system, everybody would be viewed as a potential donor unless they had registered an objection or "opted out" before death. Dr Tony Calland, chairman of the BMA's Medical Ethics Committee said surveys show many people who are willing to donate organs never make their wishes known, and that this inevitably results in unnecessary deaths. 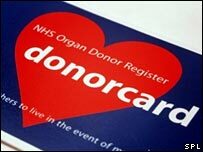 "Every year in the UK hundreds of people die because there are not enough organs available for transplantation. "The BMA believes that moving to a system of presumed consent, where it is assumed that people are willing to donate their organs after death unless they opt out, combined with other reforms to the transplant infrastructure, would play an important part in improving the organ donation system so that more lives can be saved. "These figures demonstrate that support amongst the public is growing for presumed consent. "We hope the government will take note of the growing level of public support for this change." There are 7,234 UK patients waiting for an organ transplant. Last year, 3,086 organ transplants were carried out, thanks to the generosity of 1,495 donors. A spokesman from UK Transplant said: "We welcome any kind of announcement that creates debate about the system in place. At the moment, donors need to remember to sign up. "People should discuss their wishes with their family and loved ones." Health secretary, Alan Johnson said: "We know there is a shortage of organ donors and I am committed to trying to improve the situation. "Following the recommendation of Liam Donaldson, the Chief Medical Officer, I have asked the organ donation taskforce to look into the issue of presumed consent, taking into account all views to determine whether this is the way forward."